Textured striping chicly decorates the matte black finish wood frame of this rectangular beveled wall mirror. Enhance a bare wall space with this stunning rectangular wall mirror. A matte black finish wood frame trims this accent, with gorgeous beveled edges. 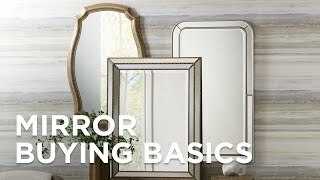 The mirror can conveniently be installed vertically or horizontally. 36" wide x 47 3/4" high x 4 1/4" deep. Hang weighs is 44 lbs. Glass only section is 25" wide x 37" high x 1" deep. Surrounding frame is 5 1/2" wide. Kyoto rectangular wall mirror from Global Views. Can be installed vertically or horizontally. Hangs with a 25" wooden french cleat (included). Matte black finish. Gmelina wood frame construction. Beveled edge. Latitude II Matte Black 23 3/4" x 25"
Bring a relaxed look to a living space with this small framed rectangular wall mirror with round black metal brackets.